Atlanta interior designer Vern Yip gained popularity via a number of television shows, including Trading Spaces, Deserving Design, HGTV Design Star and, most recently, Urban Oasis. Today he splits his time between homes in New York City, Atlanta and Rosemary Beach, Florida and has just released his first book. 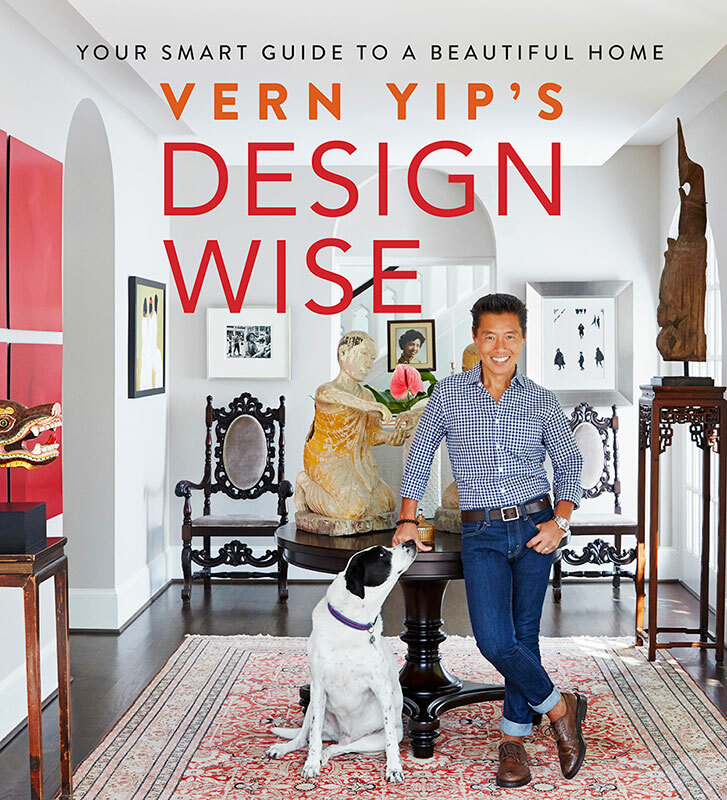 With Vern Yip’s Design Wise already a New York Times best seller and currently in its third printing, this popular designer and star of television and print couldn’t be more proud of his first venture in book publishing. Having just completed a tour for his debut book, Yip shares that the inaugural project wasn’t something he entered into lightly. As a huge design book fan―who admittedly has them scattered on every surface of every room of his own home―Vern wanted to be sure he had something significant to offer readers and fans. “I took so long (to write a book) because I wanted to do something purposeful,” says Vern, who has 800 copies of the new book sitting in his dining room for him to sign. Looking at the spectrum of design books on the market, Vern says they either bury great info deep in paragraphs where it gets lost or are primarily just page after page of beautiful photos. “In my years of being on television and writing for the Washington Post and HGTV, I noticed some of the same questions over and over from people,” he says. The questions tended to be basic things that people think designers pull out of thin air such as how high they should hang pictures or how high the light fixture should be above the their dining room table. The info in Design Wise is presented in a beautiful coffee table format with information in bullet pointed lists for quick reference to “take the scary nature out of the equation,” says Vern. Knowing certain rules exist allows the designer to focus more on the esthetics, the things most people associate with design, he says. For new designers joining a difficult but rewarding industry, Vern says success will only come to those who are very passionate about it and are willing to put in the hard work. “It doesn’t necessarily mean that you have to go to school to study interior design, but it does mean you have to know what you’re talking about and have to have a broad base of reference,” he says, adding that the world of interior design and the knowledge it requires is often misunderstood. His second suggestion to new designers is to travel and see the world with their own eyes, meet the people, experience the architecture, taste the food. “These are the experiences that build that broad frame of reference,” he says. With regard to branding, Vern advises focusing first on having something to say. “In these days of Kim Kardashian, everyone is very focused on building a brand. I think branding is a secondary or tertiary thing that comes after you’ve pursued something with passion and have determined what you want to say,” says Vern. While everyone wants to build a brand, very few are successful, he says. “It’s not just about building a brand; it’s about having a point of view and pursing something with vigor. Building a brand is a natural extension of that but it only comes if you work hard, have good intent, have a clear voice, and really have something to say,” he continues. Vern closes by saying his entire career has been built on helping people understand that great design can really improve the quality of life on every socio-economic level. “I’ve worked really hard at it, and I’m just beginning to build my own brand,” says Vern. For more information about Vern Yip, visit his website at www.vernyip.com.